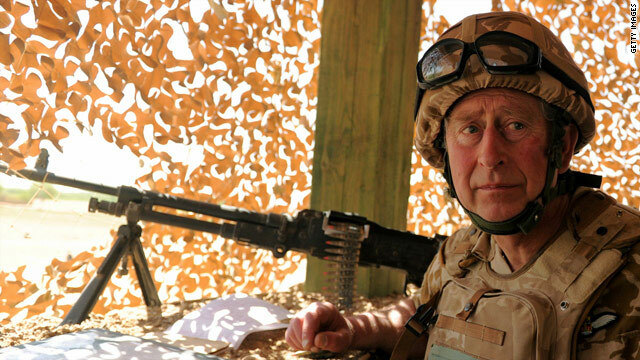 Britain's Prince Charles spent a night at a military base in Helmand province. (CNN) -- Britain's Prince Charles left Afghanistan on Thursday after a previously unannounced two-day visit there, a spokesman said. Prince Charles met Gen. Stanley McChrystal, the top U.S. general in Afghanistan, as well as Afghan senior government ministers and tribal and religious leaders to gain their perspective about reintroducing stability to the country, the spokesman said. President Hamid Karzai was on an overseas trip, so the prince was not able to see him, the spokesman said, although he said the two spoke on the phone before Prince Charles traveled there. Prince Charles' younger son, Prince Harry, 25, served on the front line in Afghanistan and saw combat. He is training to become a pilot with the Army Air Corps. -- CNN's Sarah Sultoon contributed to this report.